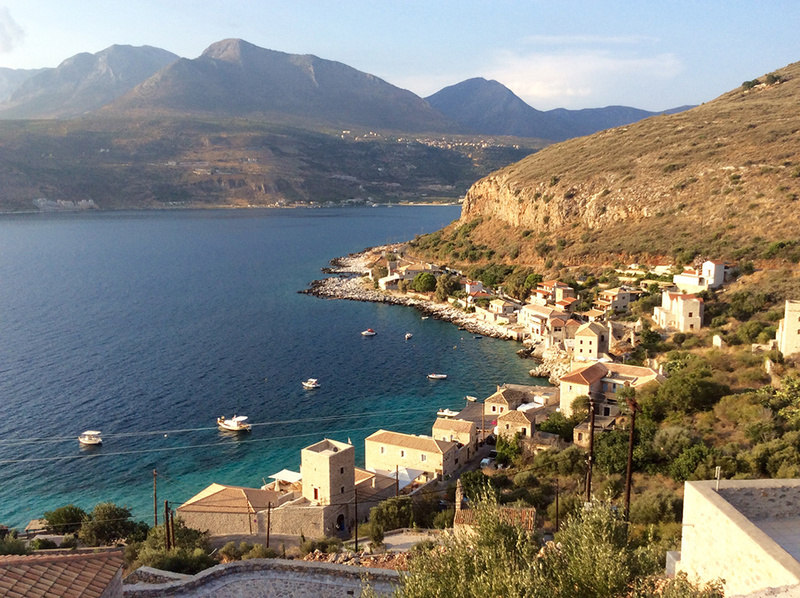 The Peloponnese is a well-known destination for road trip aficionados. You probably remember my trip up to Kalavrita in late spring. Driving south, you will find yourself spoiled for choice: Ancient Olympia, the Olympics birthplace, Mycenae and the lions, Epidavros with the ancient theater operating in summer, Nafplio and Monemvasia with their forts and the byzantine castle city of Mystras just off of Sparta. There are many layers of history tangled around the lush green mountains of Taygetos, the spine of the Peloponnese, and many stops worth the drive until you hit the beach. I left everything behind though and headed straight for the shore. I made Gytheio my base and went ahead to explore the middle finger, Eastern and Inner Mani. To be honest with you, I had no itinerary, I was just heading to crystal clear waters and in the handful of days I spent there I visited some of the gems of Mani’s shoreline. I made a little map for anyone that feels like visiting and some photos for you to enjoy. Mani is not your typical tourist place, perhaps with the exception of Gytheio and its many sea-side taverns. Driving down from Gytheio deeper into laconic lands, there is not a single shop selling hats or suncreams. The fertile olive groves give way to high peaks as bare as the moon. When your gaze slides down from the windswept scrub peaks there are little harbours to shelter a handful of boats. Some bays are pebbly, others sandy all with exceptional green-blue waters. There are some very well-known harbours amongst them such as Gerolimenas and Porto Cayo, very popular with yaghts. The sea-side villages are tiny and tightly built with fig trees and huge prickly pears. It’s not a densely populated place and if I wasn’t there in the height of summer I am sure half the villages would have been completely empty. I can almost hear you asking, what was the best bit? Well, it’s hard to pick one in favour of the other. Limeni is so pictoresque, emerging out of the sea, Mezapos has unparralelled sunsets, Mavrovouni has the largest stretch of sandy beach and Cape Tenaro unobstructed views to the Aegean. I was really impressed with Areopoli’s night life, a true gem with plenty of choice of eateries and cocktails. I can tell you my favourite beach, Marathos, the second little bay of Kokkala. Its refreshing cobalt waters keep on calling you in. There is no way you will leave this place on your own initiative. You can just stay and gaze out at the sea. Ah, bliss. But the best is actually the trip itself that gives you amasing views of the area with hidden castles and bays and unobstructed views that recharge your batteries. Have you been to Mani recently? I would love to hear your experience down there and if you have another beach to add to the list, fire away, thats what the comments are for. PS yes, there will be more picture material, this was just the shoreline. It was really lovely, all the way. I just stopped for a quick coffee and a dive in Kotronas, if only I knew! They even had a beach party on the day! And yes, you are right, Maniates are very very interesting folk 😉 Can’t wait to get back down again.